As they age, America's 78 million baby boomers will live more active, creative, inventive lives than any generation before them. This represents a truly enormous business opportunity. 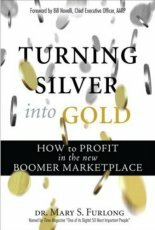 In this book, the world's number one authority on marketing to "post-50" baby boomers offers a complete blueprint for profiting from that opportunity. Dr. Mary Furlong reveals breakthrough product and service opportunities, and gives you the tools, resources, techniques, and data you need to capitalize on them. She offers powerful insight into baby boomers' new lifestage transitions in housing, health, fitness, finances, family, fashion, romance, travel, and work -- and the new brand choices they're about to make. Throughout, Furlong combines extensive, authoritative market research with inspirational stories about passionate, tenacious entrepreneurs and brand leaders who are blazing new trails in these fast-growing markets. You'll learn how to segment boomer markets, and identify opportunities to innovate entirely new categories of products and services. You'll discover which sales and marketing strategies really work, and even uncover opportunities in the surprising worldwide boomer market.